I have a jam packed review and tutorial for you this week. I am featuring one of the iconic Urban Decay Eyeshadow Palettes in Ammo. I bought this at Sephora on my last trip to Doha and have only recently started playing around with it. 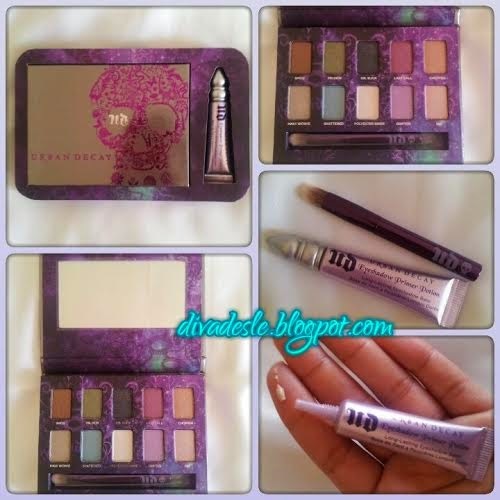 The palette comes with 10 eyeshadows that are a favourite in the Urban Decay range. With the palette is a mini eyeshadow brush and travel size Eyeshadow Primer Potion. The palette is encased in a really pretty metallic grey and purple casing. It is the size of a small pocket book and can be easily tucked away in your handbag or makeup bag. The palette opens up like a book to reveal the 10 bold eyeshadows and mirror which is a perfect size to do makeup on the go. The Urban Decay eyeshadow in its original packaging; Inside the palette, The eyeshadow brush and primer potion. Swatch of the primer potion on my fingers. I was very excited to use the Eyeshadow Primer Potion for the first time as many beauty vloggers have been raving about this gem on YouTube. The primer potion I have comes in a little 11ml tube, but a little really goes along way. I squeezed a tiny bit onto my fingers and rubbed the primer all over my eyelids. The consistency of the primer is creamy and spreads effortlessly across the eyelid. Only a tiny amount is needed to prep your eyes for makeup. I used 5 out of the 10 eyeshadows to create the look down below. I don't even know what to call this eyeshadow look I did. 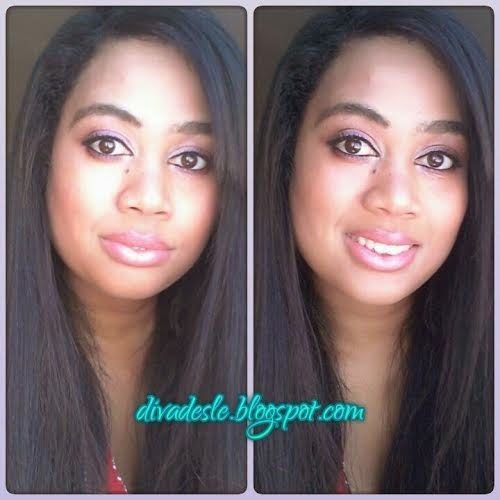 I was inspired by Arabian makeup on YouTube and Pinterest and decided to do my own Diva Desle version of it. Firstly I prepped my eyes with the primer potion to make the eyeshadows pop and last longer. Following from top left across. The eyeshadow colours look much bolder in real life than in the photos. 1. I used the lightest shade of the palette called Polyester Bride, which is a white glittery shade, and swept it across the inner corners of my eyes and brushing outwards all over the rest of my lids. This will brighten your eyes and make them seem big bold and beautiful. 2. I took my base colour which is Last Call and brushed it all over my eyelids. The eyeshadow is a glittery purple and plum shade. I love this colour as the glitter is not very shimmery. It is just enough to give my eyes a pretty glow. 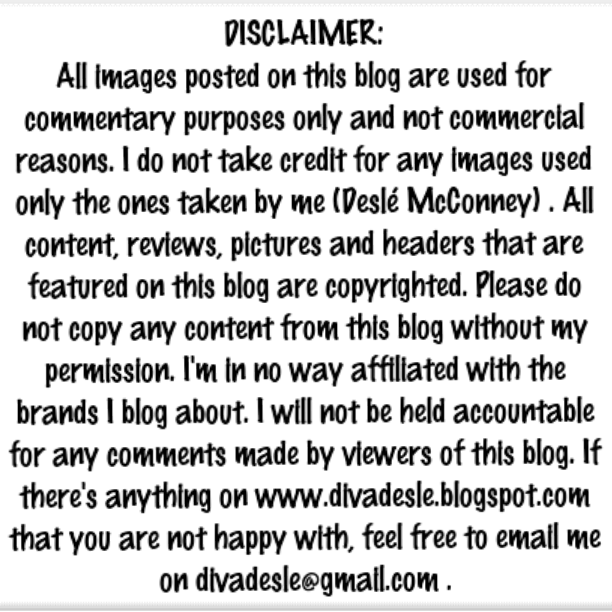 As you can see in the pictures above it looks really great on my eyelids. 3. I then applied a metallic gold shade called Copper to the inner crease of my eyelid and blended it out really well with the Last Call shade. The key to making your eyeshadow look beautiful and natural is the blending. Always make sure that you blend your colours well into each other. Harsh eyeshadow lines look terrible and unprofessional. When in doubt just blend! 4. Once everything is blended in, I lightly applied the black eyeshadow called Oil Slick to the outer corners of my eyes in a V- shape. This is just to create a little bit of shadow and depth on the eye lid. The black eyeshadow has tiny particles of glitter in it but it is more matte than the rest of the eyeshadows so it's great to line your eyes with as well. 5. I used my finger and rubbed a little Polyester Bride, which is the glittery white colour to my brow bone. 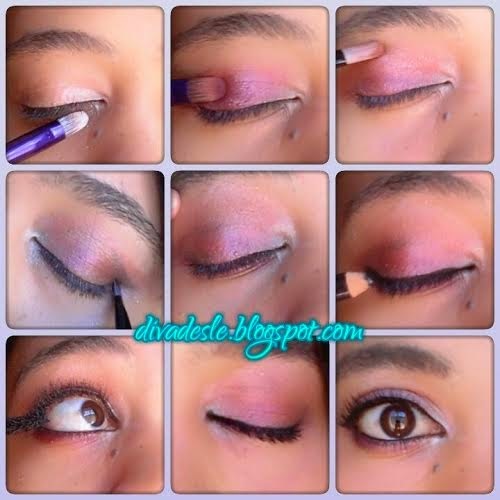 This is a great way to highlight your eyes and again make them stand out and look bold. 6. I applied black eyeliner to the bottom and upper part of my eyes. The line on the top is much thicker than the bottom. I tend to freestyle when it comes to applying eyeliner. I like to follow the pencil with my lash line and as I get to the end of my eye I make the line a little thicker. On the bottom of my eyes I applied a thin line of eyeliner to my water line. 7. To round it off I coated my lashes in tons of my favourite mascara. Right now I am loving Lancome Hypnose Drama Mascara. 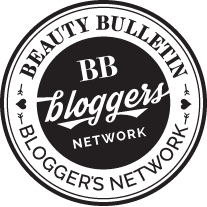 It elongates my lashes and gives it lots of volume without drying it out. 8. Lastly, I lightly dusted the purple/plum shade of Last Call at the bottom of my eyelashes just to keep the base colour as the centre of attraction. Please excuse my hair in these pics. I should have ironed and styled it before I used my camera! So this is the end result of my Urban Decay Eyeshadow Palette. I am very happy with this little palette. The 5 colours that I have used so far have really proved to be excellent quality in pigment and are long lasting. I would recommend using this palette at night or when you are going to a party or special occasion. The colours are very bold and pigmented with some glittery shimmer. It is really great to use when you want big bold and dramatic eyes. I am not done playing around with this gorgeous palette yet. I will do another eyeshadow tutorial soon and include swatches of all the eyeshadow colours in the palette. You look stunning hun, love this palette and your expert makeup skills! Have a great week doll! Thank you Sam same to you! It's a beautiful palette Desle. The colors remind me of jewels! HaHaHa I NEED that primer in my life. I've heard awesome things about it. Love love love! This looks amazing! 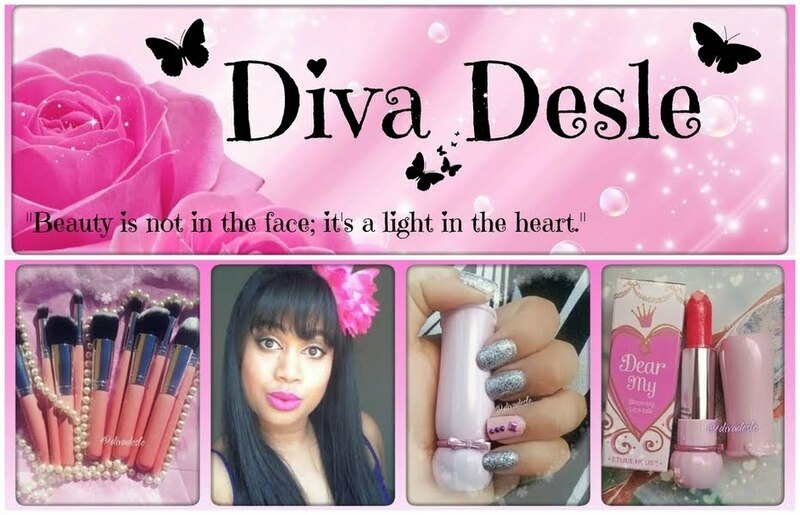 Your Diva Desle version is stunning babe! I love the look of this palette and the look that you created. I'm definitely an Urban Decay fan. Can't wait to add something to your collection! Ooh you're just making me jelly with all the Qatar shopping. I want to shop there too so I can spoil you too!